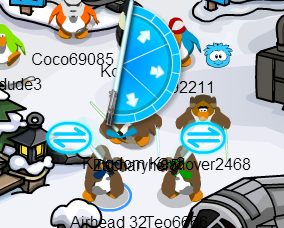 Star Wars Takeover: How to fight with lightsaber on Club Penguin. Hey everyone! The Star Wars Takeover is finally here and along with the party Club Penguin brought us some new cool lightsabers to battle with our friends. Lightsaber duels are very important for this party because there are a lot of exclusive items that will never be back on Club Penguin again! Let's get started. Now that you're in a fighting stance then you need to be patient and wait for someone to step into the two blue circles next to you. This may take a while or it may go by fast because like I said finding people will be easier on more populated servers. Once you have found someone you'll notice that there are three arrows. The three arrows give you a choice of how to attack. If you click the top arrow then you will attack the other player from the top. The middle arrow, you will attack to the middle and the bottom arrow, you will attack from the bottom. If you want to win, and i'm sure you do, then you're going to have to be strategic by choosing arrows. For example, if the other player chooses the top arrow and you choose the middle arrow then you will win because the other player is going to raise his arms up and wont be able to block the attack that you chose.